It was a much looked forward to time of year. School holidays were very close at that stage. Gathering for the bonfire meant that for weeks beforehand we would scour the countryside collecting item that would be used as fuel for the bonfire. Logs, branches, disused timber, old furniture, old tyres, etc were collected everywhere and piled high in a heap to be set alight on June 23rd. It was a great time of year for young children. School holidays were close now and good times were coming. The schools did not take holidays in those days until the end of June. 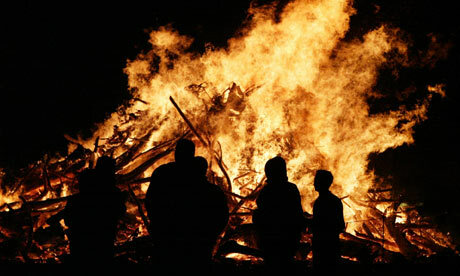 On the evening of June 23rd, another of the ancient Irish fire festivals begins. This midsummer festival was known as St. John’s Eve, or Bonfire Night, which probably took its name from “Bone Fire Night” as it was said locally that a bone should be burned in the fire to cleanse the fire and the land around. It was a wide-spread tradition throughout Ireland. Unless the weather was too cold, summer swimming in the local rivers began on St. John’s Day and the observance of the festival was supposed to eliminate all danger of drowning. In our day it was mostly the young that gathered round the fire. There was much fun and it was a time for sweets, soft drinks and ice cream. Sometimes some older women would attend for a short time and recited prayers for the gardens and for good weather. They would often take a half burned stick from the fire home with them to throw in one of their own fields to bring good luck to the forthcoming harvest. Some people used to take the ashes from the fire then extinct on the following morning to scatter them on their fields. It is said that in the mid 1700s that the young men used to walk through the fields with lighted torches and then cast these into the fire. This was supposed to bring a blessing on the fields and protect the crops from harm. It was also customary that small objects of piety, such as rosary beads, little statues or scapulars, when they became broken or worn out were destroyed without disrespect by being burned in the bonfire. All blessed and consecrated objects were destroyed by fire when they were no longer of use or broken in those days, and, of course this would add to the sacredness of the fire. It was believed that a house built on a path frequented by the fairies and travelling spirits would suffer from midnight noises or supernatural manifestations. Perhaps too, ill luck in the farm or personal illness might afflict the family. 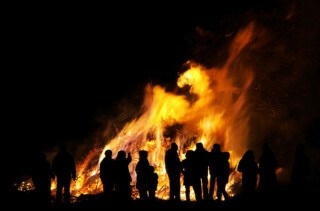 One remedy for these evils was to bring on St. John’s Eve a portion of the blessed fire and to build from that portion on the path in several places small fires which would be left burning until morning. This page was added on 07/01/2015.